Batgirl Premium Format Sideshow Collectibles : 53 cm height collectible figure of Batgirl, the DC Comics character. Criminals, beware! Sideshow presents the Batgirl Premium Format™ Figure. 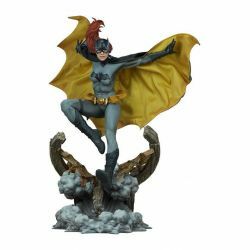 The Batgirl Premium Format™ Figure measures 21” tall, as Barbara Gordon drops in from the rooftops, bursting through a shattered warehouse window to catch criminals in action. Several smoke bombs form dramatic grey plumes as she makes her dynamic descent through jagged windowpanes into the seediest parts of Gotham. The resin Batgirl Premium Format™ Figure features a modern sculpted grey bodysuit, detailed with textured paneling and piping, complete with a gold utility belt, black gloves and boots, a holstered grappling gun, and a black bat symbol. Barbara Gordon wears an intense expression beneath her sculpted cowl, while her long red hair flows dramatically behind her. Batgirl also features a carefully tailored fabric cape, with a black textured exterior and a gold inner lining along with matching stitching details. Multiple internal wires allow you to craft the perfect pose for her cape as she makes her bat-like leap into the fray below. Gotham belongs to the Batgirl, and she belongs in your collection ! Bring the Batgirl Premium Format™ Figure into your Bat-Family of DC Comics collectibles today.